Tourist Circuits in Rajasthan: Rajasthan is state with vibrant colors and culture. Rajasthan or the Land of Kings, is true to its name with lavish forts and majestic palaces that are apt reminders of a rich, romantic past that speaks of heroism, honor and chivalry. Amidst a stark desert and surrounded by the Aravallis, India’s oldest mountain range, the State stands out like a beacon, attracting travelers with its rich art and culture. There are so many vibrant and colourful festivals held across the state that give visitors to Rajasthan a reason to celebrate almost throughout the year. Tourist Circuits are promoted by Government of India and state government to provide better infrastructure to tourist and brings historical places on tourism map of world. 3. Hadoti Circuit (Bundi-Jhalawar-Kota-Baran) - Keshoraipatan, Bijolia, Menal, Ren Basera, Jhalapatan, Gagron Fort, Buddhist Caves and Stupas, Bhainsrodgarh, Badoli, Darrah Wildlife Sanctuary, Sitabari. 4. 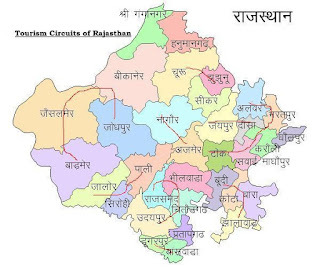 Mewar Circuit (Udaipur-Chittaurgarh-Bhilwara-Rajsamand) - Udaipur, Eklingji, Nagda, Rikhabdeo, Jaisamand Lake, Kumbhalgarh, HAldighati, Nathdwara, Rajsamand Lake, Chittaurgarh, Bassi Wildlife Sanctuary, Dhariyavad Sita Mata Sanctuary, Nagari. 7. Desert Circuit (Jodhpur-Jaisalmer-Bikaner-Barmer) - Osian, Balsamand Lake & Garden, Mandore, Jaisalmer, Ludurva, Wood Fosil Park, Akal, Deset National Park, Kolayat, Devi Kund, Gajner Wildlife Sanctuary, Hanumangarh, Kalibanga. 9. Shekhawati Circuit (Sikar-Jhunjhunu) - Khatu Shyamji, Sikrai Mata, Jeen Mata, Lohargal, Harsh, Mandawa, Fathepur, Nawalgarh. Please Note: Sometimes questions is asked that "How Many Tourism circuit in Rajasthan ?" with options like 7,8,9,10. We didn't find any official Number of Tourist Circuits in Rajasthan on state government tourism website. However anyone have link Please share in comment.